Chante en Français 1 is an audio CD containing 36 tracks of songs and poems to support French language learning. It is aimed at ages 4 - 11. It comes with a full transcript, with English translations, and will become a firm favourite with all children! 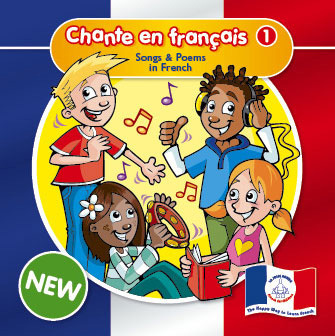 The songs on this CD are a mix of original songs written especially for French beginners, and traditional French children's songs. 4. Salut! - Song 22. Chante en Français 1 is aimed at French beginners. It is recommended for ages 4 - 11 (Early Years, Key Stage 1 and Key Stage 2). I have not listened to the CD, it is intended a Christmas gift to a girl in the family. But it looks very fine. The only thing: I would have appreciated a little bigger textbook. I have this CD in both French and Spanish and I LOVE that majority of the songs are the same melody and lyrics! They are very catchy and the lyrics are easy to pick up. I'm really happy that there are many themes, such as counting, days, months etc. A great resource! Lovely French songs catchy and easy to sing with my class. We also add a little dance to go with some of the songs. This CD is great for teaching young children French and the older children also enjoy revising some of the basics. Super melodies and clear lyrics make this a very good choice. Why has the music changed? I bought this CD to replace one that had gone missing in school... It arrived very quickly and all communication was good from yourselves, but I cannot believe that you have changed the music for a quite a few of the songs. Why? Is it possible to still get hold of the original? We are not the publisher of these CDs but have been selling this version for several years now. This is the only version that we have ever stocked and we're afraid that we are not familiar with the content of any previous editions. It may be worth you contacting the publisher - La Jolie Ronde - for further information. This has a good mixture of 'made for teaching' and traditional songs, as well as some spoken tracks. I'm using it in primary school and have found something for every year group. The children love the songs.